#Our first Irish Setter litter was born on 10 of October. This page is dedicated to our Irish little baby-girl - Pendledell Anise or just Anise. She was born in England. Many thanks to her breeders June and Bill Henderson for this amazing, beautiful and very elegant girl. We love her very much. She is very active girl and we hope she will have great results not only on show circuit but she will be a great hunter. 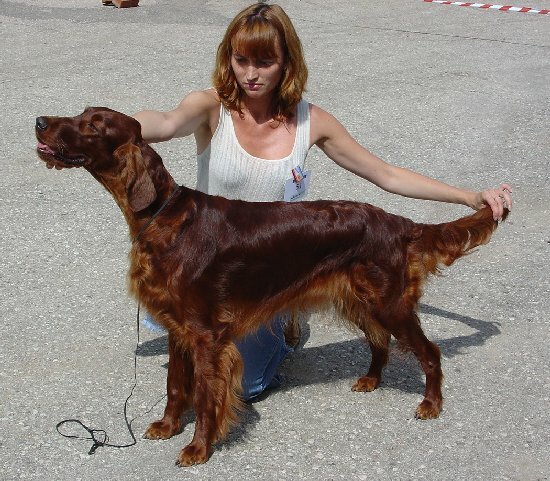 You can find here also an information about Irish, English and Gordon Setter' history, breed standard, schedule of international shows in Russia and other information concerning Setters. So - have a nice and interesting time on our site and explore it by your self. St.Petersbyrg, Russia, 15 May 2001.